Vocations: What Was I Made For? How Do I Know What God is Calling Me To Do? Name: Vocations: What Was I Made For? How Do I Know What God is Calling Me To Do? 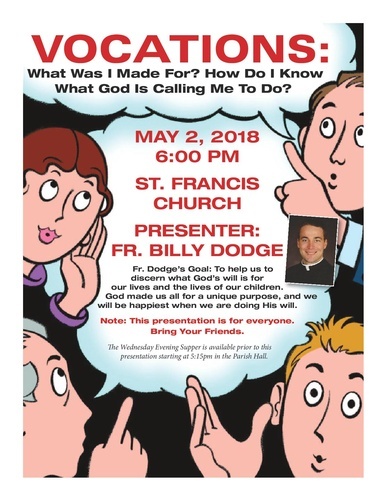 Father Billy Dodge will help discern what God's will is for our lives and the lives of our children. God made us all for a unique purpose, and we will be happiest when we are doing His will. ​This presentation is open to the public. Bring your friends and family. ​The Wednesday Evening Supper is available prior to the presentation. The supper starts at 5:15pm in the Parish Hall.